I went to see an old friend Wednesday and it was well worth the trip to Oceanside. Rusty Miller gave a presentation at The California Surf Museum. He basically just talked story and showed a few slides but the energy of the evening bore straight to my heart. The stories were about old times. Rusty started surfing in the '50s. This is pre-Gidget stuff back when surfboards were shaped on the beach under palm fronds by guys who could swim miles, spear fish and ride any type of wave with or without a board. He was from Encinitas and talked about about Diffenderfer, LJ Richards and Phil Edwards showing him the ropes. Great stories too about Hynson and Skip Frye. And told with such eloquence! The best part was that Skip and LJ were there and told their stories about Rusty as a rambunctious little freckle faced Grem. There were other legends in the audience including Rusty's old rival Malcome Macassy (did I get that right? ), Peter Townend and Tom Morey. John Dahl, of Sticky Bumps and Wax Research, also had some great Rusty stories. 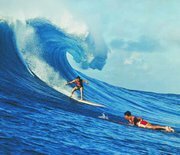 All in all, It was just great that the true spirit of surfing is still alive. Rusty has been living in Byron Bay, Australia, for the past 40 years and runs a surf school there. Check him out at rustymillersurf.com, byron-bayguide.com.au or on Facebook at rustymillersurf. Thanks Rusty for a great evening.